Genius at Work: 2017 Here We Come! Well, here we are then. Another year rolls round. Time for a new calendar - The Avengers are confined to my office dustbin and the Guardians of the Galaxy now grace my wall. Outside, there's a bit of blue sky, a bit of grey, the threat of a sunset and the hint of leftover rain. Nothing to indicate the passage of another year. Nature understands days, months, seasons and years. They are the natural cycles of the Earth, Moon and Sun, and they have influenced our very existence. So when the Earth is back to the same place in its cycle around the Sun, we humans let off fireworks, dance in the street, fall down drunk and, most bizarrely of all, make ridiculous promises to ourselves about the new things we'll do. Gym owners love this time of year, of course. If you have joined, or resolved to join a gym this year then the staff will be calling you a 'GBV' - not to your face of course. It stands for 'Gone By Valentines', an indication that your best intentions will last for exactly 6 weeks before your shiny new kit bag joins all the other life change junk in the cupboard under the stairs. The invention of the electric light bulb forced a new rhythm onto the human race, the rhythm of industry. 24 hour working days, 7 days a week. The supermarkets close for just one day a year, just long enough for us to feel withdrawal symptoms and separation anxiety. So what? I mean, a big, fat, hairy, so what? Think of all the terrible things that 2016 brought us. Celebrity deaths a-plenty, wars, tragedies, natural disasters. Plane crashes, hijackings, terrorist plots, Brexits, Trumpovers, currency woes, stock market woes. Good riddance 2016, we all say, you were a useless year anyway. Some people have taken to social media to ask their friends to list wondrous and delightful things that happened during 2016, but the list is short. In truth, it was just another year. And so, like the lemmings at the top of this page, we hurl ourselves over the cliff because, well, because that's the way it is. A year ends, a year starts, the same old routine. Make promises, forget them, pretend it all never happened. 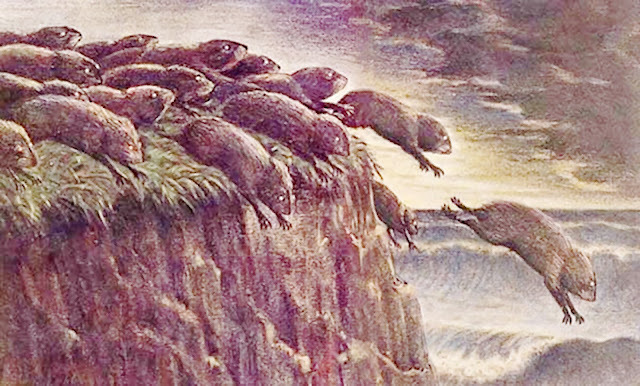 Now, you probably know that lemmings don't actually jump off cliffs unless they are being herded by a Disney camera crew. So in reality, the only reason why you'd repeat the same old routine is because you're being herded towards that cliff. Who is pushing you? Be honest, you're pushing yourself, aren't you? Well, stop it. Embrace the natural rhythms of life. You're like a tree, you need time to shed the old and create the new. You need a rest, a break, time to regenerate. Reject the electric light! Tell your boss you're going home at 5:00! Take up a hobby for the weekend! Learn to recognise your family again! Reacquaint yourself with your duvet! Hit the snooze button! Hit it again! And again! You are not a bottomless reserve of energy. You do not have an endless supply of life. You are not immortal. Another year will always come along, you may or may not live to see it. But sure, spend the evening on that spreadsheet. Spend your weekend preparing for that conference. Have some more caffeine, that will replace all that lost sleep. Buy yourself some paleo juice. And on the way home, read all the adverts, hoping to find the answer there. You know the answer already. Happy New Year!